LGFCU offers scholarships to North Carolina local government law enforcement members for professional development. 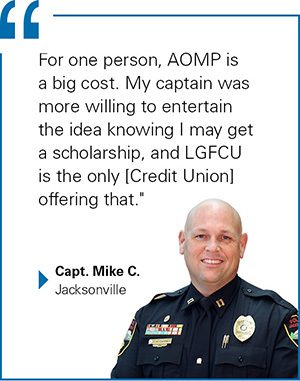 The Administrative Officers Management Program (AOMP) and Law Enforcement Executive Program (LEEP) scholarships are available for North Carolina local government law enforcement personnel who are members of LGFCU. Scholarships are applied to the cost of tuition for these two programs offered through the North Carolina State University Public Safety Leadership Initiative (PSLI). LGFCU supports these programs because of the instrumental role they serve in the professional development of our membership. Applications received after a deadline will go into consideration for the following application period. If you have any questions regarding the application process, email us at aomp-leep@lgfcu.org or call 800.344.4846. Apply now for the AOMP/LEEP Scholarship.